“Did you know that you can store vehicles at Discount Mini Storage? You can store a boat, an RV, a motorcycle, or any other vehicle at one of our secure locations. You can rent a covered parking spot, a garage, or a secured outdoor parking space at several of our locations. Here, you can rent affordable uncovered parking spaces, perfect for a boat, RV, or other vehicle. Remember also that includes a secured facility with fencing, digital video recording, security code accessed gate, and onsite office staff. There’s never a long term contract to sign—everything is month-to-month. If you have sporting or boating equipment to store along with your boat, you can rent a secure storage unit at the same location. 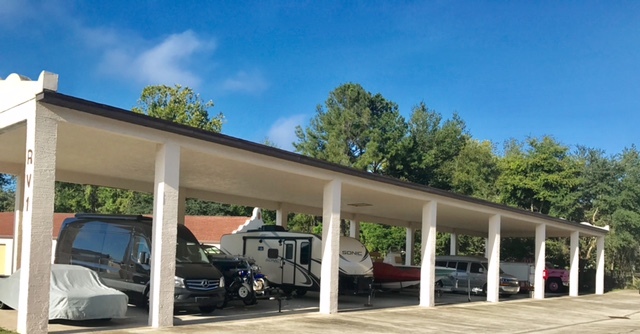 If you’re looking for a Covered storage solution for boats, RV’s, or any other vehicle, this location is perfect. Here you can rent covered shelter vehicle parking in a secured facility. We also have indoor and outdoor storage units here, in varying sizes. This location is secured with fencing, video recording, security gate, and onsite office staff. You can find us at 708 S Hwy 441, Lady Lake, FL. At Discount Mini Storage, you can rely on clean, secure storage for your RV, boat, motorcycle, or vehicle in a convenient location.